Over the years, our family has collected dozens of different Haggadot for the Passover holiday. They range from the highly traditional to the decidedly modern. We have classic Haggadot with commentaries from the Me’am Lo’ez (originally written in Ladino by Rabbi Yaakov Culi in 1730), Rabbi Marcus Lehman of Mainz (late 1800s) and Efrat Chief Rabbi Shlomo Riskin (a bit more recent – from 1983). Plus a highly annotated Artscroll Haggadah that’s 225 pages long. On the more progressive side, there’s the Carlebach Haggadah with a selection of teachings from the famed singing rabbi; the liberal, egalitarian Velveteen Rabbi’s Haggadah; and the wonderful “A Night to Remember: The Haggadah of Contemporary Voices” by Mishael and Noam Zion. We also have a smattering of straightforward Haggadot with minimal commentary. The only missing Haggadah: a classic Maxwell House, which our family used growing up but didn’t seem to make aliyah with us. I asked Ben David why take on the Haggadah – one of the mostly widely published Jewish texts of all time? 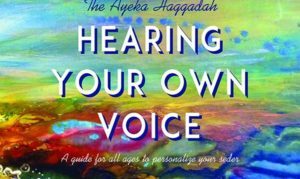 The Ayeka Haggadah does that by interspersing, amidst the traditional text, some 40 open-ended questions, specifically crafted to evoke spirited discourse. They are divided into five categories. Last year I wrote a column in The Jerusalem Post called “A Seder for Non-Believers.” In it, I proposed using the Haggadah as a loose framework to trigger discussion on “contemporary personal, political and professional concerns” rather than rote reciting the whole text. As soon as I heard about the Ayeka Haggadah, I knew it would be a perfect prompt for a Blum-style Seder. At Dayenu: what would be on your gratitude list for the Jewish people? We didn’t get to that one. Maybe next year in Jerusalem. For information on how to order a copy of the Ayeka Haggadah for your Seders to come, visit www.ayeka.com. I first wrote about this great new Haggadah at The Jerusalem Post. Next post: Why live in Israel?